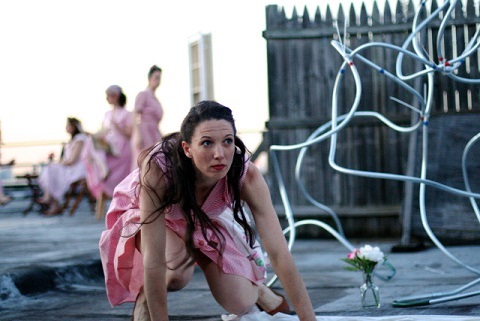 “Burrow” by The Bardos Ballet Theater takes to the indoors to avoid rain falling. Time does not diminish his popularity, nor our curiosity about William Shakespeare, who turns 450 on April 23, 2014. His talent is timeless, and oft feted. In celebration of the “Bard of Avon” on his upcoming birthday, Ross Williams’ New York Shakespeare Exchange initiated a year-long Sonnet Project, in which all 154 sonnets will be filmed at various locations around New York City. The invitation only launch party for the Sonnet Project at the Museum of the Moving Image on May 20th, will feature Tony-winner Cady Huffman. She will read a sonnet and joins actors Lynn Cohen, Austin Pendleton, Michael Urie, and Joanna Gleason, among others, all of whom also appear in an upcoming sonnet film. The goal is for the films to reach an audience of 1,000,000, with each short film released on the website www.SonnetProjectNYC.com. Sites for the films include courthouses, and parks, the Brooklyn Bridge and the Queens Unisphere, Chelsea Piers, and the Bronx. There is now an app for Android mobile devices available at Google Play and a mobile app available for iPhone and iPad at the Apple App Store, so you can catch these short films anytime. Also happening in public spaces and the parks are the Bardos Ballet Theater’s free dance performances. Billed as “Burrow,” the dances by choreographer Cynthia Anne Stanley and architect Maria Sieira will pop up as “sneak attacks” in sites around town. 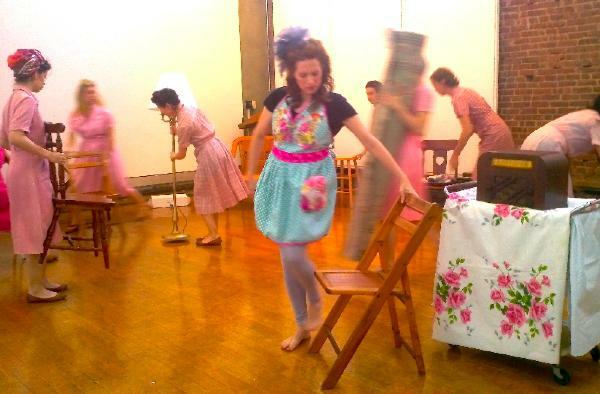 In “Burrow,” twelve women construct and deconstruct dwellings, as they keep the homefires buring during WWII. 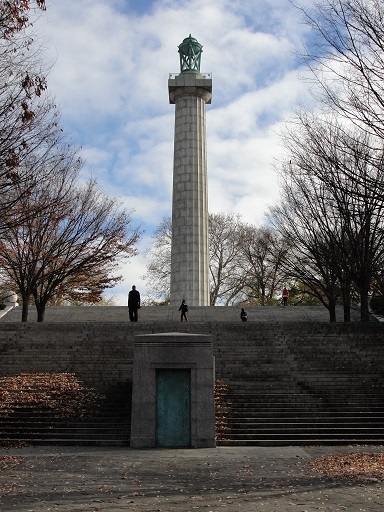 “Burrow” will be at Foley Square Fountain on May 19th at 7pm, on the 24th at Fort Greene Park Steps. Two hush-hush appearances on June 2nd will be in Manhattan at 11am and then somewhere in Brooklyn in the early evening. Picnics are welcome, but only friends of the Bardos Ballet will get exact directions to participate in these stealth events. They’ll head indoors to the Martha Graham Studios. Stay in touch with The Bardos Ballet Theater so you can be there. Bradford Cover as Sir Harry and Rachel Botchan as Kate in “The Twelve Pound Look” from The Pearl’s This Side Of Neverland. Photo by Al Foote III. If it weren’t for Walt Disney, the flying, Tinker Bell and Captain Hook, “Peter Pan” would be widely recognized as the adult fairytale it truly is. Children for the most part aren’t that interested in not growing up. Sean McNall as Charles and Rachel Botchan as Mrs. Page in “Rosalind” from This Side of Neverland. Photo by Al Foote III. In J.M. Barrie’s two one-act plays, capping the 29th season of the Pearl Theatre Company as “This Side Of Neverland,” and playing through May 19th, the tales are definitely for grown-ups. J.M. Barrie (Sean McNall), narrating with a deep Scots brogue and a very merry twinkle, is the glue that binds “Rosalind” with “The Twelve Pound Look” in “This Side of Neverland.” The Pianist (Carol Schultz) leads a mostly failed (through no fault of hers) audience sing-along to aid in the transition between the acts. Rachel Botchan as Kate and Vaishnavi Sharma as Lady Sims in “The Twelve Pound Look “ from This Side Of Neverland at the Pearl Theatre. Photo by Al Foote III. The production under J.R. Sullivan’s direction strikes the charming note of Edwardian celebration. J.M. Barrie makes mischief in the neatly-drawn, sweetly satirical two parts of “This Side Of Neverland;”although the little plays feature adult-language and adult-situations, “This Side Of Neverland”gets its PG rating. 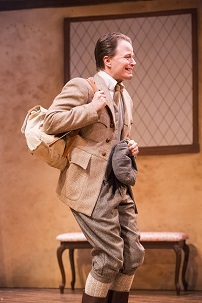 Of course, youngsters will not appreciate its mature wit nor its intelligent wisdom..
Sean McNall as Charles in “Rosalind,” the opening act of This Side Of Neverland. Photo by Al Foote III. 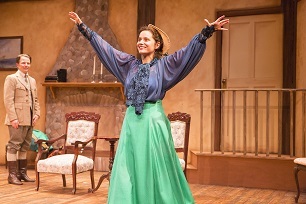 In the excellent small ensemble, Rachel Botchan is as delightful as Kate, the escaped wife in “The Twelve Pound Look,” as she is as the aging-ageless ingenue in “Rosalind.” Sean McNall is equally excellent in all the roles he undertakes, here as Barrie, and then as the boyish Charles, and the reserved slightly supercilious butler Tombes. For more about The Pearl Theatre Company, and “This Side Of Neverland,” please go to www.pearltheatre.org. Naturally impersonation is about creating an illusion. Jessica Walker in “The Girl I Left Behind Me” at 59E59. Photo by Carol Rosegg. 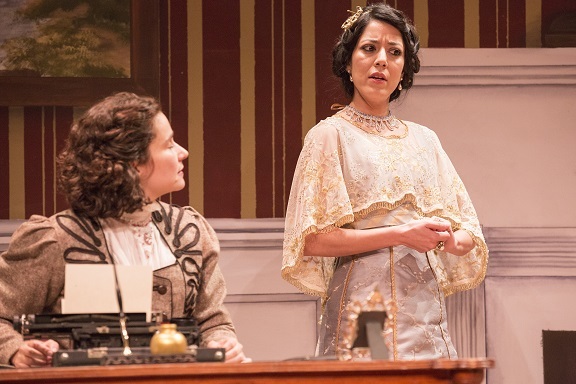 In “The Girl I Left Behind Me,” playing at 59E59 Theaters through May 19th, co-author and performer Jessica Walker salutes the women who wore the pants in Victorian and Edwardian era music halls and on America’s vaudeville stages. These ladies in trousers, like Miss Hetty King, Ella Shields, or the 6-foot Gladys Bentley from Harlem, dressed the part but sang in their natural register. Hiding in plain sight, in men’s clothing, achieved great success and had a large following. Walker and her co-writer, Neil Bartlett suggest that their admirers were complicit co-conspirators in women-worship. It’s a fact that some of these professional cross-dressers may have been lesbians. One, Annie Hindle, in fact managed a marriage by signing the certificate with a man’s name. Nice tidbit, and there are some others in “The Girl I Left Behind Me” that will amuse and edify. But, unfortunately, the historical thesis of the show is neither shocking nor all that interesting. Joe Atkins at the piano with Jessica Walker in “The Girl I Left Behind Me.” Photo by Carol Rosegg. 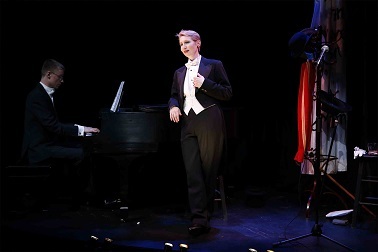 In full gentlemanly attire, with tails and tophat– one of several she doffs for her performance,–Walker shows off a finevoice and a nice way around a variety of musical styles, even the operatic. 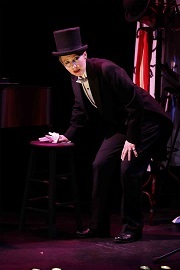 “The Girl I Left Behind Me” is presented by Jess Walker Musical Theatre and is part of the Brits Off Broadway. Learn more about “The Girl I Left Behind Me”at www.59e59.org. Work is a special kind of hell in "Bull"
Sam Troughton and Eleanor Matsuura in Mike Bartlett’s “Bull,” part of Brits Off Broadway at 59E59 Theaters. Eleanor Matsuura and Adam James in Mike Bartlett’s “Bull,” part of Brits Off Broadway at 59E59 Theaters. 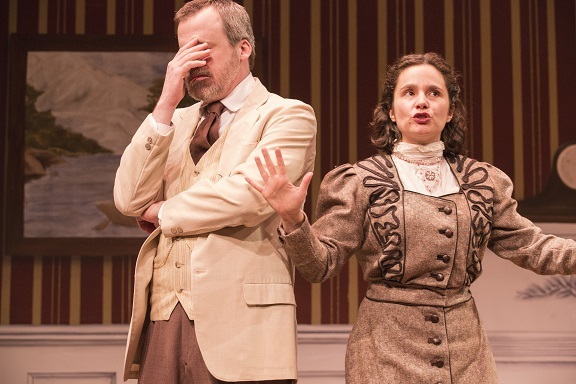 “Bull,” in a Sheffield Theatres production at 59E59 Theater’s Brits Off-Broadway festivities, through June 2nd, is in fact, a rather brilliantly brutal study of humiliation and dominance. 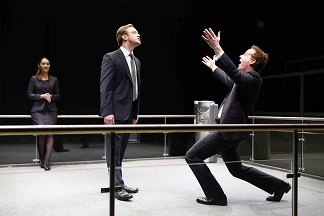 Sam Troughton and Adam James in Mike Bartlett’s “Bull,” part of Brits Off Broadway at 59E59 Theaters. Thomas (Sam Troughton) is alternately bewildered and out-manned by his co-workers, Isobel (Eleanor Matsuura) and Tony (Adam James) as he struggles to survive at work. The team is about to be pared down by their boss, Carter (Neil Stuke) whose visit the three are anticipating in an office made to look like a fight ring, designed by Soutra Gilmour. 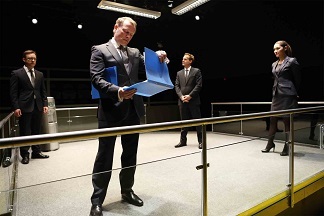 Eleanor Matsuura, Sam Troughton, and Adam James in Mike Bartlett’s “Bull,”, part of Brits Off Broadway at 59E59 Theaters. Photo by Carol Rosegg. Choreography by Allistair David and Fight Direction by Christian Thomas. The actors move about aggressively– or in Thomas’s case defensively– with choreography by Allistair David and Fight Direction by Chrisitan Thomas, in a Darwinian dance of death. The ensemble, under Clare Lizzimore’s direction, is superb. “Bull” creates the very definition of a hostile work environment. For more information about “Bull,” visit www.59e59.org.